We didn’t have any particular inspiration for the flavour of the cake, but our starting point was based on a cake we saw on Pinterest. It simply said “Find the toenail”. Thus, our hilarious starting point. 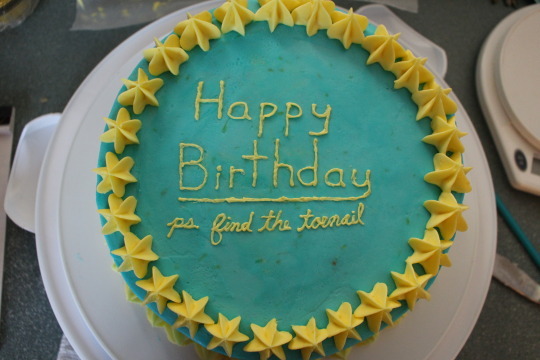 Because of this “toenail” that was supposedly hiding within the cake, we needed something with a bit of texture, like coconut or some sort of rind. 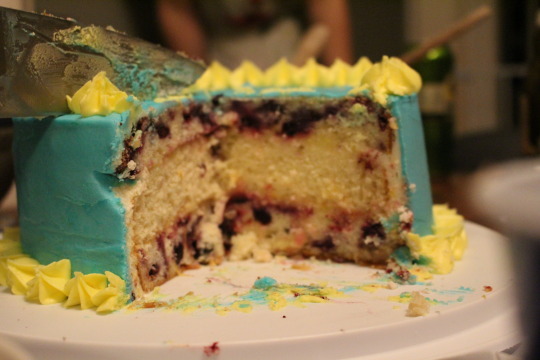 I suggested an old favourite: Sweetapolita’s Triple-Lemon Blueberry Layer Cake. It was pretty different from the cake I made Stephen last year. Sadly there was no beard-spiration on this birthday occasion. Darn hospital jobs! I need to work on my lettering. Sigh. I’ve used this recipe before for cupcakes, and it has worked out splendidly. 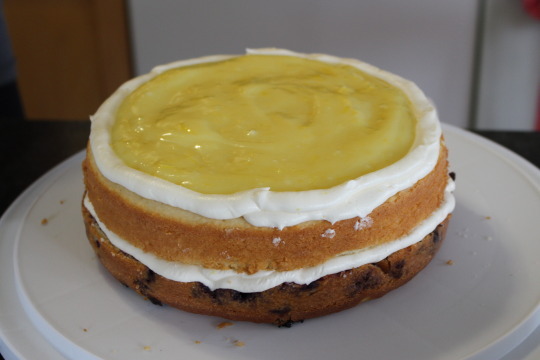 There is a lot of lemon flavour, and the blueberries add some extra fruit and moisture. I was quite happy that the flavours turned out to be just as excellent in the cake. I was a little bit disappointed because the layer without blueberries seemed to be a bit drier than I would have liked. I’m not sure if we over baked it (I don’t really think we did), or if it seemed that way in comparison to the blueberry layers. Who knows. The photography at the party was questionable. Beers were had, and good times ensued. Unfortunately, the delicious curd ended up giving us some trouble. Because it was so amazing, I wanted a lot of it to be in the cake. 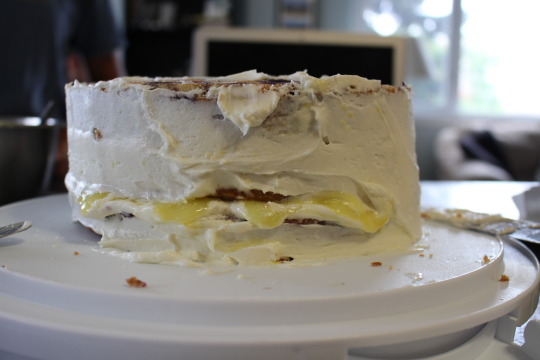 I did take proper precautions and pipe a dam of frosting, but there was so much curd that the weight of the cake caused it to squish out between cake layers. This resulted in some emergency freezer action to stabilize the cake enough so that the curd would stop squishing, and the frosting process could resume. It was not pretty. 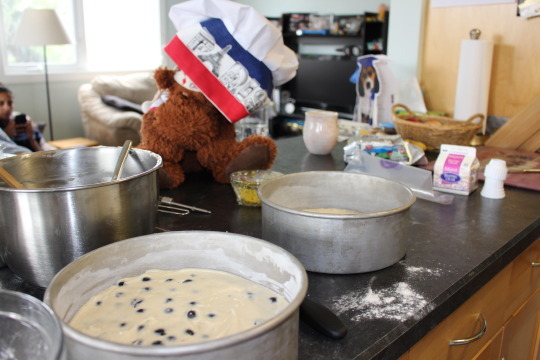 The other thing to be aware of if you planning on making separate blueberry layers, is that the blueberries add a lot of volume to the cake batter. I think we split the batter half and half for blueberry and non-blueberry layers, and the blueberry layer was twice as big as the non-blueberry layer. The blueberry layer also took forever to bake; I think it was almost an hour. Minus the lemon curd incident, I think it turned out well overall. 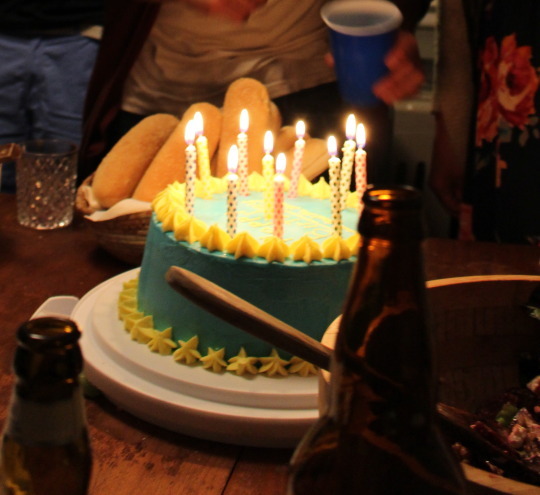 Everybody enjoyed it, and there was very little left over; really that means a bunch of drunk people liked cake. I’m not convinced this is a ground breaking reaction, because there are definitely some things about it that I would have liked to be different, but hey, I’ll take it! The recipe can be found here.